« AMAZING PROJECT! The Sapperton at Brewery District New Westminster Condo Project by Wesgroup Properties. First of 4 Residential Towers at The Brewery District Master Planned Community! Westside Vancouver homes from just the low $300’s, now selling! Just a few steps away from Winona Park, Langara Golf Course and the new shopping and entertainment district of Marine Drive Station, these Park & Metro Vancouver Langara brick homes are ideally situated in an established neighbourhood, but walkable to all the urban excitement that you seek. Park&Metro by Marcon Homes is developed by an established and well respected builder. The contemporary classic architecture is designed by award winning firm Rositch Hemphill Architects and the building will feature oversized lowE2 glazed windows to optimize sunlight, fresh air, and views. There’s a beautiful reflecting pool and entry walk bridge to each building and generous outdoor living spaces. Some ground floor homes at Park&Metro Vancouver condos will have courtyard entry gates too. The building will have underground parkade, fob and key access lobby with video surveillance as well as restricted floor access. Some of the green initiatives of the Park&Metro Vancouver Langara brick homes include a smart, walkable and pedestrian friendly community with easy access to major transit routes and public transportation, water conservation with low flow toilets, shower heads and faucets in addition to drought resistant landscaping as well as energy conservation with high efficiency heating and cooling system, domestic hot water, energy efficient common area lighting and windows. 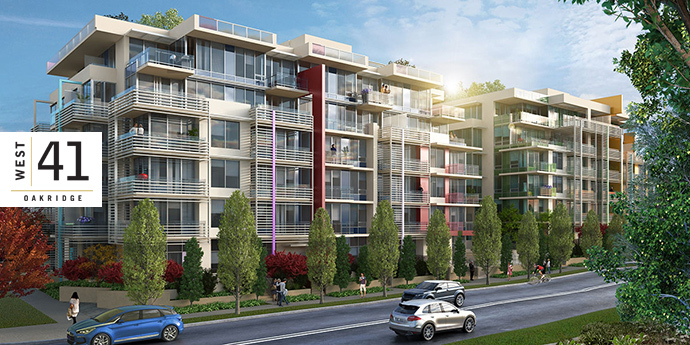 Other green features of the Westside Vancouver Langara homes for sale at Park & Metro brick homes include emissions reduction with pre wiring power to select parking stall locations for electric vehicles, a comprehensive recycling program and much more. Each home also comes with the Telus Future friendly technology with Telus Smart Hub, free Telus TV and high speed internet for one year and storage locker for each home at the parking level. Find your perfect pairing here at the pre-sale Vancouver Park&Metro brick condo residences! Luxury 1, 2 and 3 bedroom brick homes in established Langara Vancouver westside neighbourhood are coming soon to the market! Steps away from Langara Golf Course, Winona Park and the new shopping and entertainment at Canada Line Marine Drive Station, the new Vancouver Park&Metro brick homes is unlike any other and presents the perfect combination of life and style. The new Vancouver Park&Metro condos are brought to you by Marcon. The project site location of Park & Metro is at West 63rd Avenue and Yukon Street Vancouver BC. For more information, please visit the Marcon Park&Metro Vancouver web site at www.marcon.ca/parkandmetro. The interiors of the homes are approved by world renowned Shermain Tai, a master in the ancient Chinese Laws of Feng Shui and they are certified as harmonious with nature. 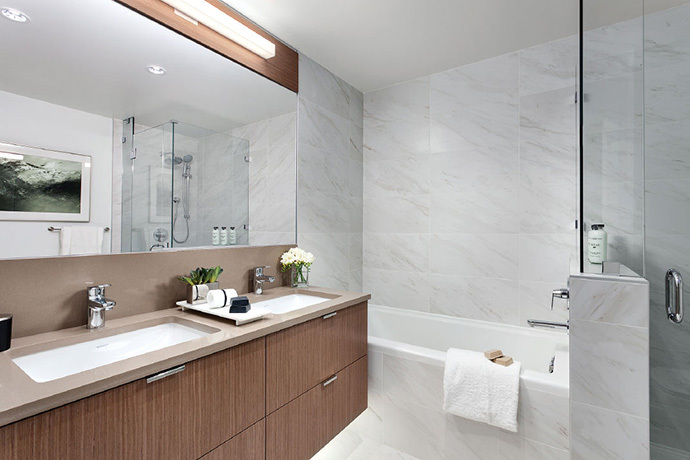 In addition, there are 2 contemporary interior palettes for presales homebuyers to choose from at Park&Metro Langara Vancouver condos, a Blomberg Energy Star rated stacked front loading washer and dryer in every suite as well as sleek two inch white faux wood blinds on all exterior windows. There is a built in wall safe in the master bedroom in addition to carpeting in the bedrooms (scrolled level loop nylon) and laminate floors in the kitchen, living/dining and den with either Walnut or Brushed Oak palette. 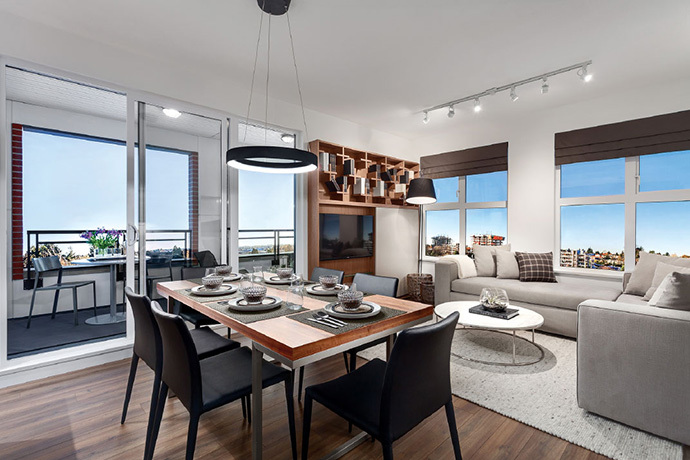 The bright and contemporary interiors at Park&Metro Vancouver Langara brick homes are designed and carefully selected by Gannon Ross Interior Design. All homes at the Westside Vancouver Langara homes at Park & Metro will feature high efficiency heating and cooling for year round comfort in addition to built in USB charging connection in the living areas and bedroom. All homes have Bosch fully integrated stainless steel appliances as well as interior doors with Taymor Equinox satin nickel lever and solid core wood entry door with deadbolt and eye level viewer. Here’s a list of the premium stainless steel appliances by Bosch that will be a feature of your new Langara Vancouver home at Park&Metro by Marcon: Bosch 30” Energy Star rated fully integrated bottom freezer Benchmark Series with dual evaporator SuperCool SuperFreeze LED lighting (for two bedroom homes) or a 24” for 1 bedrooms as well as a Bosch 30” 800 Series five burner gas cooktop with low profile design. Other Bosch appliances include a 30” 500 Series electric wall oven with self clean, Ascenta Series fully integrated dishwasher, stainless steel tall tub with adjustable rack and overflower protection system and a 30” microwave/hood fan combo in select homes. There is also a Faber Cristal slid out range hood fan with stainless steel underside in some homes. The Park&Metro Vancouver Langara brick homes will also have a Panasonic Genius Inverter Microwave Oven with trim kit in most homes as well as distinctive full wrap cabinetry with square edge profile with soft close hardware and featured millwork in select homes. 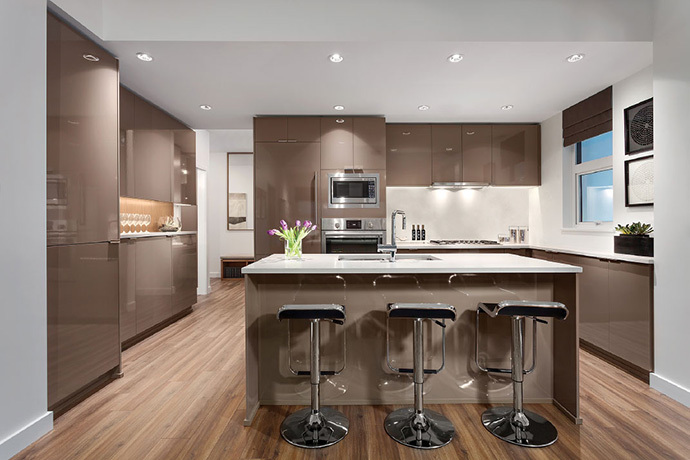 Other kitchen features at the Westside Vancouver Park & Metro Langara condos include full height pantries for added storage (select floor plans), solid quartz three centimetre countertops with eased edge and two centimeter backsplash in either Alpine Mist or London Grey. There are double bowl European style stainless steel under mount sink, Grohe Minta sleek starlight chrome single control high arc pulldown faucet, in sink waste disposal system and recessed pot lights with LED under cabinetry lighting (strip). Select homes at Park&Metro Vancouver Langara brick homes will also feature Lazy Susan rotating trays for added convenience. There is a beautiful range of Park&Metro floor plans for this centrally located Langara Vancouver Westside development that includes 1 bedrooms (Plan A around 517 square feet to D1 at 700 square feet) plus lots with dens or tech spaces. The 2 bedroom Park&Metro floor plans begin with Plan E at 829 square feet with others including dens and tech spaces as well. The larger 3 bedroom Langara homes for sale at Park & Metro are ideal for couples and growing families and they start at over 1,000 square feet. Many of the larger homes have expansive outdoor living spaces and terraces (some over 1,000 square feet of outdoor space!). The building itself will be only 4 storeys and there are only 5 penthouses available at the presale Vancouver Langara Park&Metro condo project. Located at West 63rd Avenue and Yukon Street Vancouver, the Park&Metro Langara homes for sale features only 73 brick flats that have spacious floor plans that range in size from first time homebuyer 1 bedrooms to family sized three bedroom layouts. This is a very rare opportunity to own a brand new Continuum home in the Westside Vancouver Langara neighbourhood. As well, the project will consist of two 4 storey buildings that create many corner homes with seamless integration into the surrounding well established West Side community. As well, the Westside Vancouver Park&Metro Langara brick homes will feature a close proximity to the Canada SkyTrain Line, lots of shopping and dining options, Langara College and inviting green spaces.